Thank you for visiting the "Constitutional Sheriffs" page. Did you know that your sheriff is an elected Law Officer and that the SHERIFF'S ONLY DUTY AND RESPONSIBILITY is to the Constitution of the United States and to protect the Rights and private property of the citizens? Did you know that the Sheriff has more power than the FBI, CIA, and even the President of the United States and Mr. Obama? UPDATE: We’ve been contacted by police chiefs and other groups or individuals who want to be counted among the valiant as well! Look for their list after the sheriffs. 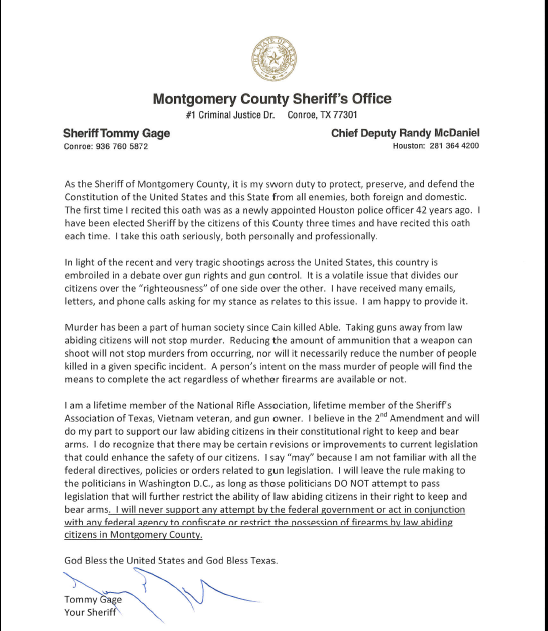 The following sheriffs, state sheriff’s associations, and police chiefs have vowed to uphold and defend the Constitution against Obama’s unconstitutional gun control measures. We applaud these public servants for their courage and conviction. The remarkable thing about what these brave men and women are doing is that nobody told them to do it. Neither the CSPOA nor any other organization that we are aware of contacted sheriffs across the nation and asked them to make statements; this is something sheriffs did on their own, or because their constituents requested it of them. Soon, people started submitting letters and links to us, and it was such a remarkable thing that we started to collect all the names and list them together. Then the miracle happened: Other sheriffs across the nation have been inspired by the courage of those who stood first. Now we see the power of standing, even if you fear you may stand alone. NOW, powered by the gaining momentum of this movement, the CSPOA has joined with other like-minded organizations in a largely volunteer effort to contact all the remaining sheriffs and ask them for a statement. You can read more about this effort here. Note: A statement from a state association does not necessarily mean that every sheriff in the state supports it. One such case is is Florida, listed below. This statement was voted on and approved by a majority of the sheriffs in the association, but not by EVERY sheriff in the state. While other lists may include all sheriffs within such a state, we have chosen to list associations and individual sheriffs separately. We are in the process of researching and posting links to online statements for all entities on these lists. You can help us by sending us links to statements by any of them.If you know a sheriff or association that should be listed: Please send us the sheriff's full name, county, and state along with a link to an online statement by the sheriff if available. You may also email us supporting documents via the contact page. NOTE: Some persons or organizations on this list state that they are in favor of further gun restrictions in order to 'keep guns out of the hands of criminals and/or the mentally ill.' The CSPOA is NOT in favor of these programs becasue we realize they just can't work without controls that would severely limit the freedoms of law abiding citizens. We also recognize that throughout history, gun registration is always followed by confiscation. And guess what: a required background check is the same thing as required registration. Let's not be stupid. Once the info is on file, it's going to be abused.HOWEVER, we are listing individuals who are still trying to have it both ways because we believe they have taken the first positive step by stating that they will defend the constitutional rights of the citizenry. We hope they will soon realize that the two ideas cannot exist together. Names added recently are marked with the number of days since added, in the 'NEW' column. For instance, 5D = Added 5 days ago.